When Packt approached me about writing a book about Zendesk, I was torn. While I felt honored having been asked in the first place, I was worried about all the extra time I would have to spend in front of the PC. Working from home, I spent most of my days in front of a screen and I wasn’t sure if I could do the extra hours. Despite that, I already knew: I could not decline the offer. I have always wanted to write a book and this was too good of an opportunity. Finally I can say that I am done and Packt published the book a couple of days ago. And yes, all the extra work was worth it. At the end, when holding the book in my own hands, I am more than happy to have gone through with it all and I am thankful to Packt for this opportunity and great learning experience. But what was is like? Writing for Packt is a very streamlined process. After the initial contact by the Acquisition Editor and a few emails back and forth, the author is asked to provide an outline of the book. The outline is supposed to describe the book's structure and list its objectives. It consists of a description of each chapter, topics covered and the expected length (in pages). Once the outline has been accepted, Packt will draft the contract and provide a deadline for each chapter. Of course the author has a say and can adjust those dates according to their schedule. Once the contract has been signed by both parties, the author is introduced to a Content Development Editor, who will remain the main contact until all the chapters have been handed in. After that, the author will be in contact with the Technical Editor and the Reviewer of the book. The author will receive a commented version of each chapter and implement the necessary changes. And that is it. Well, it might take a while and it can be a frustrating process at times, but Packt does an outstanding job when it comes to author-relations. So what is my book about? “Zendesk is a cloud-based customer service solution that is widely used because it is easy, efficienct, flexible, and low cost. It is highly scalable and is great for organizations of all sizes. 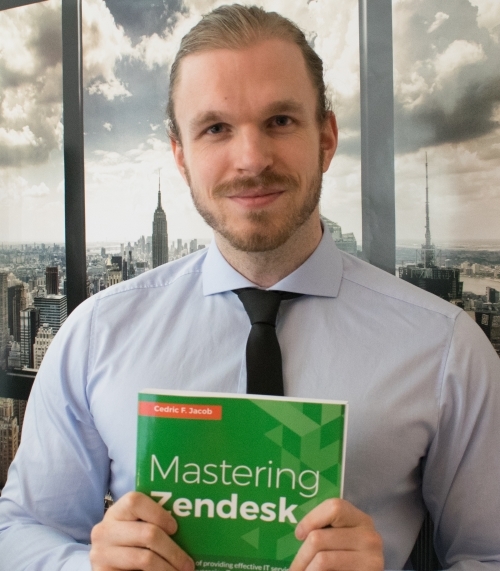 If you’re a Zendesk administrator and are looking to explore advanced-level concepts, then this book is for you. It covers the core functionalities such as managing users, groups, and the organization, and creating and adding custom fields. You will learn how to add customized ticket channels to your account. Then, you will focus on customizing business rules and extending Zendesk with JIRA and Salesforce. Towards the end, the book emphasizes security and troubleshooting aspects as well as providing tips and tricks to create a more efficient support environment. You want to buy the book? The book is availible online and can be purchased on Amazon or ordered directly from Packt. If you are not looking to buy a hard copy, you should be able to find it on any major platform for e-books as well. I am looking forward to people’s feedback. If you are working with Zendesk and are not sure if this book is for you, feel free to hit me up.